In the last iPad tutorial, I explained how teachers and students can use the Study Cards feature of the iBooks app to review glossary terms, main ideas, and Review Questions. A major part of that tutorial focused on effective highlighting with a designated color for Study Cards. Check your eTextbook reader app to be sure it offers multiple colors for your highlights. 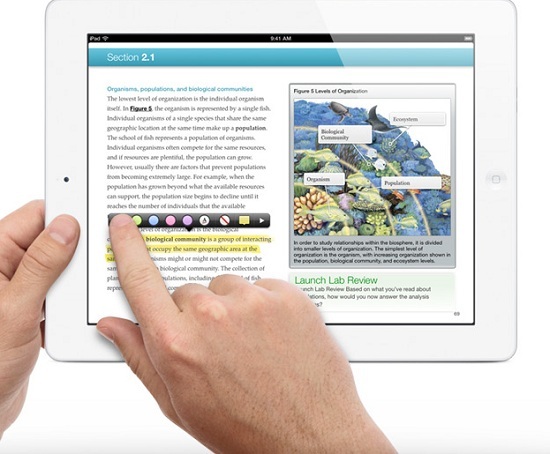 The iBooks iPad app, the Direct Digital app, and the GoodReader app (for PDF eTextbooks) all include the ability to highlight in more than one color. First, let's focus on the purpose of highlighting. To increase engagement with what students are reading, they need to do something active to help them organize new information into their brains. When reading printed books, this may include highlighting, writing notes in the margins, taking notes on paper, outlining what they read, or creating a mind map. Unfortunately, highlighting becomes an incredibly passive way to read books. We end up highlighting well-written sentences or long paragraphs with important information. What we are left with is a set of interesting sentences and paragraphs. Now that highlights and notes are so easy to see in a book and access outside of the book context, we need to become better highlighters and teachers of highlighting skills. What is the purpose of a highlight? Review. If we never review the highlights we've made, then we've wasted our time. If we do review our highlights, and notice that we've highlighted nearly the entire text, then we are again wasting our time. Highlight sentences that summarize main ideas of paragraphs and sections. Highlight supporting arguments of main ideas (sometimes numbered lists or bullet points). Highlight words, sentences, or concepts that you don't understand (for now). Highlight words or sentences that your teacher points to. Turn your highlights into outlines, questions, and summary points. Or, consult the highlighting suggestions in the final section of the Study Cards Tutorial, "Using iPad Study Cards to Review Reading." Most kids don't know how to study for tests and quizzes. Studying is a process that begins the first time you read something and ends in thinking creatively about ideas. I'm a huge proponent of pre-reading strategies. Most of us, whether we are teachers or students, skip this important step in reading new material. Pre-reading is reading before you read. It requires a quick scan of a section of text looking at the headings, the images, the bold words, and the first and last sentences of paragraphs to get an idea of what a selection of text is about before we even read the details. So how do you use highlighting to do pre-reading? Remember that highlights in an eBook/eTextbook can always be changed. So if you highlight something now, it can be deleted later. If you highlight something in yellow, it can easily be changed to green. Green: Words, concepts, and ideas that you already know well. Blue: Words, concepts, and ideas you've heard of or understand a little bit. Red: Words, concepts, and ideas you've never heard of. Give students a little direction by pointing out certain words or concepts you want them to preview and highlight in green, blue, or red. Next, give them five to ten minutes to look up the words or concepts they highlighted in red and blue (kind of know and never heard of). In most eReaders, students can do this directly from the app by clicking on a word or highlighted text and selecting "Search Web" or "Search Wikipedia." Have them write what they've learned in a note connected with the red highlights. As a class discuss some of the concepts they didn't know before reading that they understand now. When they read the text, they can either delete the highlights to their liking or change the colors from blue and red to green. You will need to practice this activity to get students used to this kind of pre-reading and highlighting, but eventually these will become habits. Students will find the things they don't know and utilize the incredible tools at their disposal to quickly increase comprehension. You will find that in the long run they will learn faster by engaging in a text in this way than in just reading and answering the review questions.